This challenge has now been CLOSED! Failure to get the Linfield job and even a move elsewhere I have decided that I'm going to spend at least another season or two at Bangor before I could move on and after a seventh placed finish this season, well, I'd be expected the absolute minimum again this time around but with "second season syndrome" being a thing, I'm aware it's going to be completely difficult. So without further ado three players have joined the club this summer with only one I believe is going to be a regular and that's left winger Ryan Carmichael who has joined from Donegal Celtic - right back Matthew Henry arrived from Carrick and Jack Sharvin from Warrepoint Town and both of those players will be, at least first, used as squad/rotation players. Two reserve players Chris Magee and Jonathan McElroy both departed this summer and joined Ballymoney United and Kilmore Rec respectively. 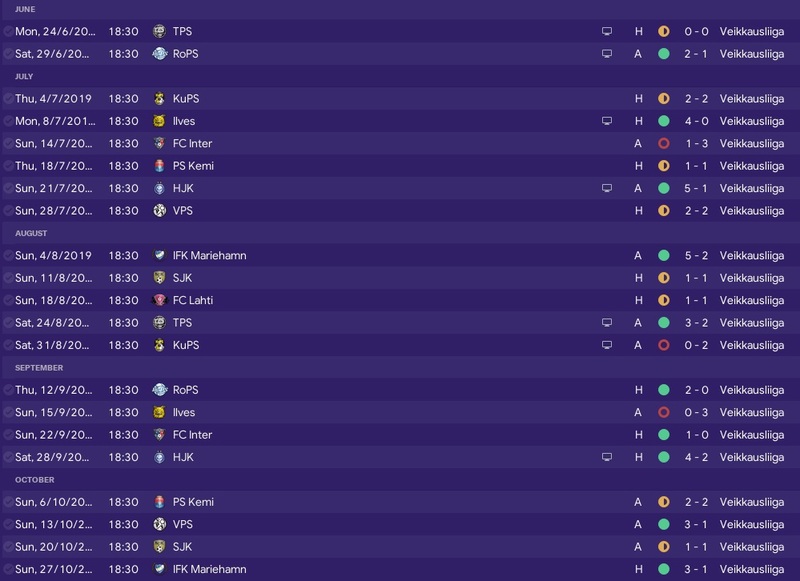 If you ignore the home defeat to Scottish side Dumbarton then preseason went quite well with one defeat, two draws and four wins from the seven scheduled games with all the games (minus Dumbarton) being away from home. The two draws came both in 2-2's against both Dundela and Newry City but we did beat Groomsport 9-0 at The Meadows, Kircubbin 3-0, Ballyclare 3-1 at Dixon Park and PSNI 3-0 at Newfordge Lane. Our league campaign begins five days after the Police game, away to Coleraine. It was a superb end to our Premiership season as the club won four out of the remaining five Premiership fixtures with the only slip up coming away to the basement club Ballinamallard which was frustrating because we usually have their "number" but the Ducks won 1-0 at Ferney Park but before that the month began with a 2-0 home success against Dungannon before the loss in Fermanagh ten days later. We would end the Premiership campaign with three consecutive wins because four days after the shock loss to the Mallards we eased to a 3-0 success at the Bangor Fuels Arena against Cliftonville, three days after that a 2-1 win at Shamrock Park against Portadown followed and then the season ended with an excellent 4-2 win at the National Stadium against Linfield. 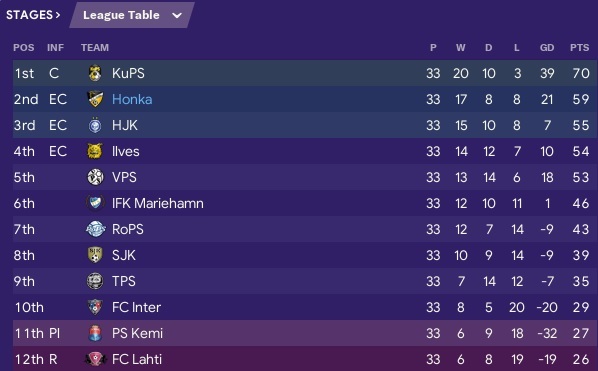 This is how the league campaign has ended and it's a seventh placed finish for the Seasiders which means we will go into the playoffs to determine who gets the extra Europa League spot so our season isn't quite over yet. As expected Ballinamallard have returned to the Championship after just one season in the top flight and Linfield will be in the relegation/promotion playoff with whoever wins the Championship playoff between the teams who finished second and third. Larne won the Premiership and congrats to them. There's going to be no European football for Bangor Football Club and that's a huge blow as we could've done with the extra finances. 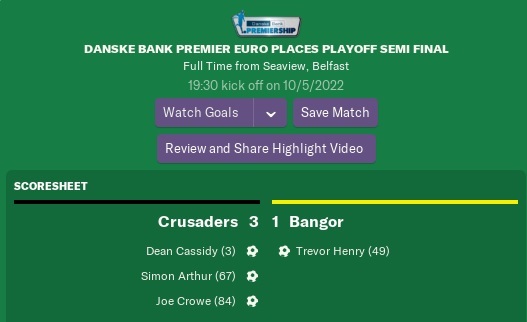 Crusaders won the semi final 3-1 at Seaview as Trevor Henry scored our consolation goal four minutes into the second half - goals from Dean Cassidy, Simon Arthur and Jos Crowe sent the Shore Road outfit into the final. Linfield lost the relegation/promotion playoff and were shockingly relegated to the Championship. Lastly. Piss. Following their relegation to the second tier (for the first time in history?) 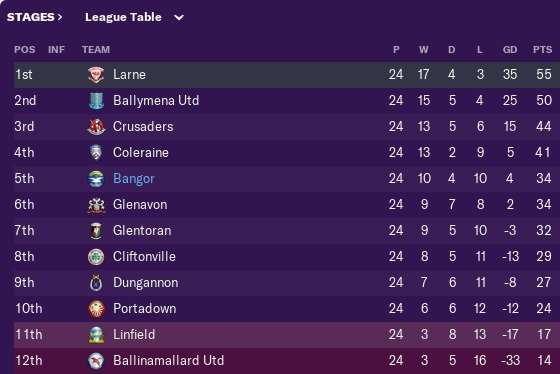 Linfield sacked their manager and I thought I'd apply as I did state I'd return to the Championship in an attempt to actually win it. I was unsuccessful. Hold on a minute. You actually done better in the league than I did? That's unacceptable! hi I dont like your site and dont see anywhere how I can delete my account ! I dont want to share my mail with you please DELETE my account ! Why did you waste time registering then? Genuine question... We don't delete accounts on here. For those who haven't completed/done this challenge - you have until 8pm on New Years Eve (Monday) to complete the challenge! The New Year didn't start particularly well with just two wins from our first six Premiership games in twenty twenty two and to make matters worse it's only two wins in the previous ten league games and the record went to just two Premiership wins in the past eleven games after Cliftonville comfortably beat us 4-2 at Solitude in North Belfast and then the side needed extra time to see off East Antrim outfit Ballyclare 4-2 in the sixth round of the Irish Cup. Our poor league form continue as it's now twelve league games without success after Ballymena edged us out in a seven goal thriller, winning 4-3 at the Ballymena Showgrounds. The final league game of February saw us pick up three much needed points but it was completely undeserved as we stole a 1-0 home win over Glentoran. The one and only game in March saw Ballymena beat us 3-1 away from home in the quarter final of the Irish Cup. So due to our retched form it's going to have to be a bottom half finish in the Premiership but baring a complete collapse in the final five league games then I'd like to think we've done enough to survive. 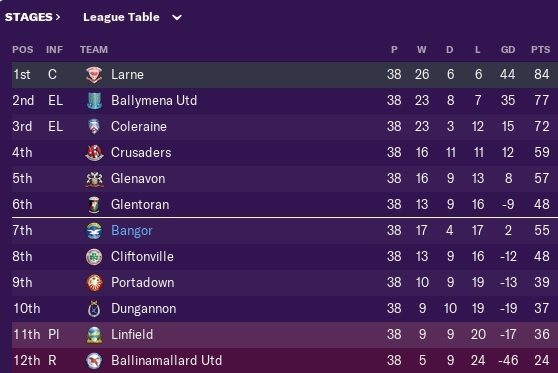 Ballinamallard are as good as back to the Championship as I can't see them avoiding relegation, Linfield remain right in a relegation dogfight and Larne remain top and four points clear of Ballymena and nine clear of third placed Coleraine as it's pretty much a three horse race for the title. 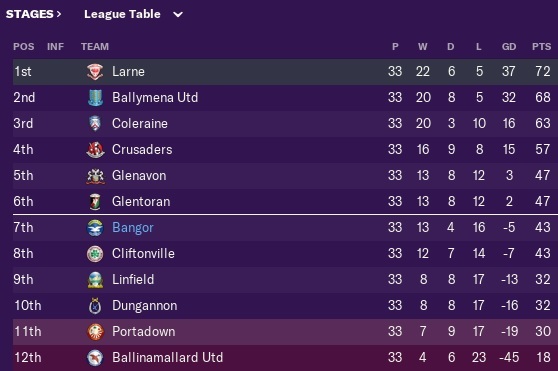 Just five Premiership clashes are remaining as we look to avoid relegation back to the Championship alongside Ballinamallard (as I said, cannot see them surviving). We have two home games against both Dungannon and Linfield and three trips to Portadown, Ballinamallard United and Linfield. It wasn't @bigmattb28 but being 20 points ahead of the basement club means we should be safe barring a complete disaster. With a poor month behind us it was important we bounced back in January as a new year began as we didn't want to end up in a needless relegation battle and yet again it was a pretty poor month as we won just two of our six Premiership encounters. A trip to Stangmore Park on New Years Day saw us return with a 2-0 success but then just three days later a 5-1 defeat at home to Coleraine saw us bump back down to earth. Bangor progressed to the next round of the Irish Cup, beating Rasharkin 4-0 away from home. Back to league action and a trip to Fermanagh saw us take on basement boys Ballinamallard and a single goal win saw us make the long trip home with maximum points - that win against Ducks would be our last league win this month as we would lose our next three Premiership games, conceding five in back to back home games as Glenavon beat us 5-2, Larne beat us 5-3 and then the month concluded with a 1-0 loss at the National Stadium against Linfield. Another poor month has seen us once again slip back down to seventh but we should still be safe enough as we're twenty two points ahead of Ballinamallard who continue to prop up the table and Linfield are still second bottom and three points behind Portadown as the South Belfast side continue to struggle. 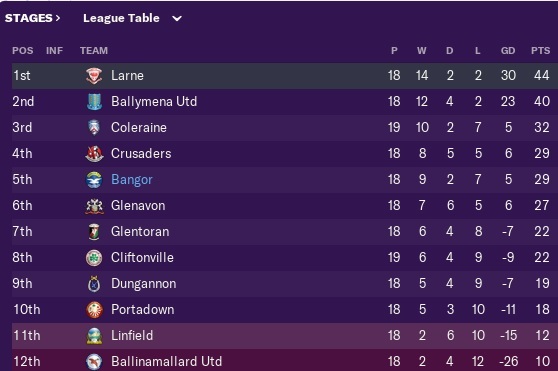 Larne are still top and are now seven points clear of Ballymena. Just the four fixtures are due to be played in February with three of them being in the Premiership and a home Irish Cup sixth round home tie against Ballyclare Comrades. We have got back to back Premiership away trips against both Cliftonville and Ballymena United before ending the month at home to Glentoran. It's going to be tough to maintain that form though @tongey but I'll sure as hell try. 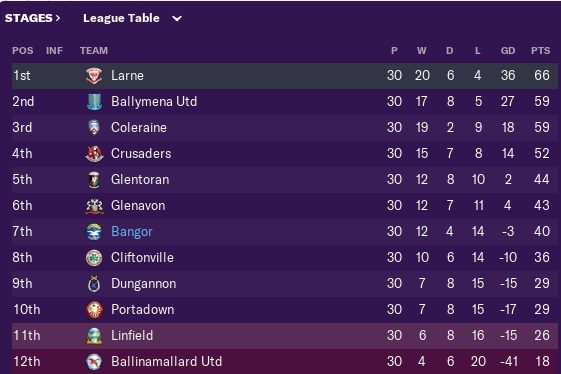 Last month ended with back to back home victories against two struggling sides in Ballinamallard United and Linfield and it was important that the form was maintained as we entered the final month of the calendar year and six games awaited us but it turned out to be an awful month with just one solidarity league win. 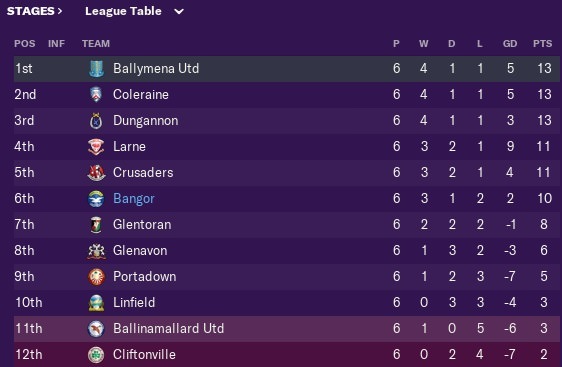 The month began with a 2-0 defeat to leaders Larne at Inver Park before our one and only league win in December as Cliftonville were beaten 5-1 at Bangor Fuels Arena, we couldn't build on that big win because just four days later and another home game followed but Ballymena returned home with a 4-2 success. We then made the short journey to East Belfast to take on Glentoran and returned home with a point following a 2-2 draw, three days later and a 1-0 loss to Crusaders at home happened before the final game of twenty twenty one took us to Shamrock Park in Portadown and the points were shared in Mid Ulster after a 2-2 draw. A dismal month (if you ignore the huge home victory over Cliftonville) and we thankfully haven't slipped in the table due to goal difference but it continues to remain tight around the middle of the table as only ten points separates ourselves in fifth place and third bottom Portadown. 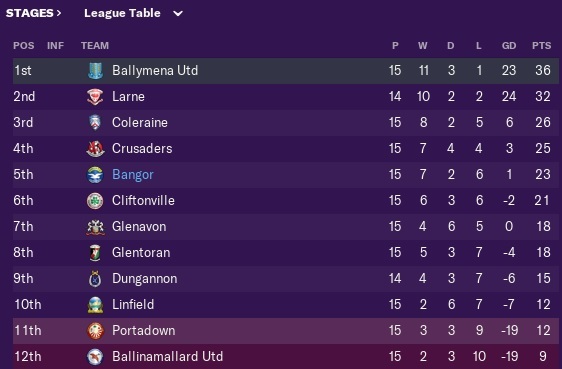 Ballinamallard United are ten points adrift at the bottom, Linfield are second bottom and seven points from safety while Larne continue at the summit and five points clear of Ballymena United. Another busy month awaits me as the new year approaches as we have six more Premiership fixtures awaiting us along with a fifth round Irish Cup away to Amateur side Rasharkin. Just like last month the Premiership fixtures are equal meaning we have three away games against Dungannon, Ballinamallard and Linfield and three home games against Coleraine, Glenavon and Larne. We should be able to beat Ballinamallard @bigmattb28 especially considering we had their number last season in the Championship, the Linfield game will be more tough even though they're struggling. So just the three Premiership games were played this month and the opening fixture took us to Mourneview Park in Lurgan to take on Glenavon and the Lurgan Blues came out on top of a five goal thriller, winning 3-2. We then had a few weeks break before our first of two home games in the space of four days - first up was bottom of the table Ballinamallard and a one sided result followed as the Seasiders won 4-0 and then beat Linfield 3-2 just a few days later to wrap up a somewhat successful penultimate month of twenty twenty one. We remain in fifth position after those back to back wins at home but the league still remains to be tight around the middle as just seven points seperate fourth placed Crusaders and eighth Cliftonville. Ballinamallard remain bottom, Linfield continue to struggle and Larne are now the Premiership leaders, four points clear of Ballymena. The final month of twenty twenty one is going to be a busy enough month as we've got six Premiership fixtures coming our way with three of them being at home and three of them being on the road. Our trips will take us to leaders Larne, fellow mid table side Glentoran and struggling Portadown while we welcome Cliftonville, Ballymena and Crusaders to Bangor Fuels Arena. 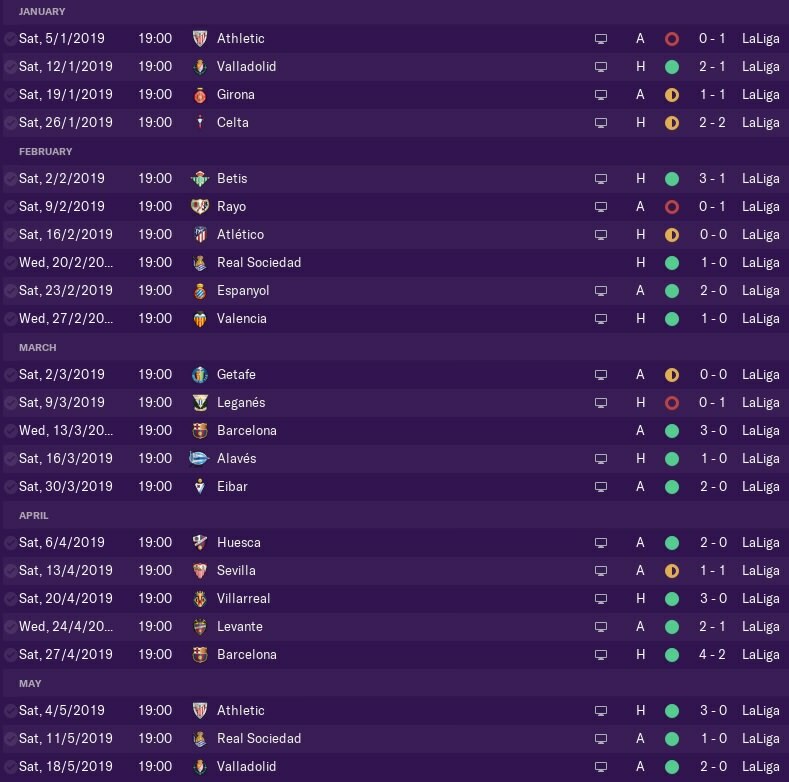 Unlucky in the cup against Leganes bud. If it's any consolation I nearly bottled it against them - I believe I needed spot kicks to get past them after nearly bottling the second leg. Perhaps to be expected @tongey, I expect to see more red circles this season than I have the past two. It's all about survival and nothing else. I agree @bigmattb28 and I'm confident we can indeed survive. Last month was a month to forget as we picked up one Premiership win from the five scheduled games and it was important we bounced back in October and the side done just that as the first game of the month saw us welcome Portadown to the Bangor Fuels Arena and an excellent 6-2 success followed but then three days later and a 3-1 loss at home to Larne saw us crash out of the League Cup in the third round. We then had a long break for the resumption of competitive fixtures and a trip to Seaview saw us lose 1-0 to Crusaders but three days later and a trip to the Coleraine Showgrounds saw us come out on top of a seven goal thriller, beating Coleraine 4-3 before the month ended with a single goal victory at home to Dungannon. A much better month has seen the football club climb up two places into fifth but another poor month or two could see us plummet again and that simply cannot happen. 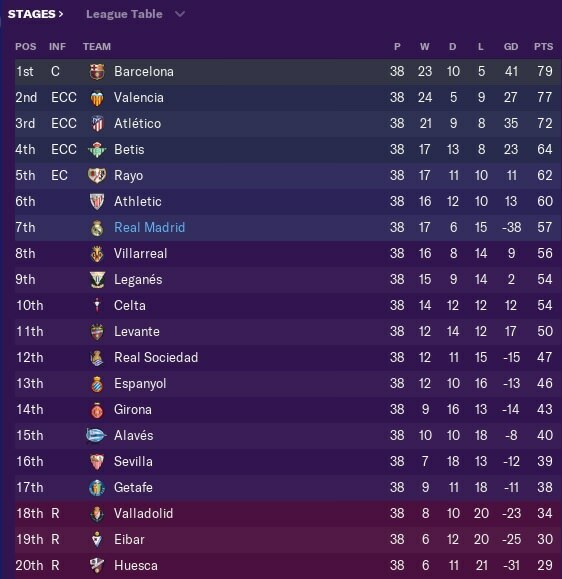 This season has been nothing but inconsistency but I suppose that's to be expected for a newly promoted side. Fellow newly promoted side Ballinamallard continue to prop up the table while Ballymena is top and four points clear of Larne. Linfield continue to surprisingly struggle. Just the three fixtures are to played in November with them all being in the Premiership - one away and two at home. The month will begin with a trip to Mourneview Park to entertain Glenavon before back to back home games in the space of four days against basement club Ballinamallard and struggling Linfield. Will you be doing another career? What a poor month and if I didn't think life in the Premiership wasn't going to be difficult, well I do now. Just the one league win arrived in our five Premiership fixtures this month alongside a Co. Antrim Shield quarter final trip against Ballymena at home in which we lost 4-1 to the Sky Blues and then our first league game of the month, also at home saw us suffer a 5-0 humiliation at the hands of Larne and then four days later Cliftonville inflicted a 2-0 loss at Solitude. The third Premiership fixture in September took us to the National Stadium (Windsor Park) and despite being battered for large parts we held out for a 1-1 draw, three days later we welcomed Glentoran to the Bangor Fuels Arena and secured our only league win this month following an excellent 5-2 win and then the month would end with a 5-3 defeat away to Ballymena United. On the back of a poor month we surprisingly have only fallen down one position to seventh but our goal difference has taken a hit and it's very important we bounce back in October or this'll be a long and stressful season ahead. Ballymena are top of the table and two points behind Larne with the Inver Men seven points clear of third place Coleraine. There's no win-less teams in the Premiership but Linfield have started the season terribly with just one win from their opening eleven games. There's four Premiership fixtures scheduled next month with two of them being at home and two of them being on the road along with a home League Cup third round tie against Larne. In the Premiership we will be at home to Portadown and Dungannon and making back to back trips to Crusaders and Coleraine in between the two home league (and cup) games. Our first season in the Premiership for the first time in thirteen seasons began at the end of July as we welcomed one of the two professional clubs to the Bangor Fuels Arena as the side took on Crusaders and despite taking the lead the side couldn't hold on and the Crues levelled on the stroke of half time and that's when the scoring ended. The first of seven games in August kicked off with a trip to Shamrock Park and an excellent 4-2 away success gave us our first Premiership success and then that was followed up with two other consecutive wins (three on the bounce!) as both Coleraine were beaten at home and Ballinamallard away 3-1 and 2-1 respectively but then the side were sent down to earth with a disappointing single goal loss away to Dungannon Swifts. Progression happened in the League Cup as Loughgal were beaten 3-2 at the BFA but then four days later and Glenavon won 3-1 on their travels. August concluded with progression in the Co. Antrim Shield as Championship side Carrick were beaten 1-0. It's been a solid start to life in the Premiership as the side sit in sixth place after the opening six games with a record of three wins, one draw and two defeats along with a positive goal difference. It's been a tough start to the fellow promotion side Ballinamallard who are second bottom with one win from six games but it's been a tougher start for both Cliftonville and Linfield who are both win-less after six games. September will see us play five Premiership fixtures along with the Co. Antrim Shield quarter final tie at home to Ballymena United while the month concludes with a trip to the same opposition - we also have trips to the win-less duo of Linfield and Cliftonville while we host both Larne and Glentoran. Decent @Rocco17? It was a fantastic season. Cheers for the comment @tongey and indeed it is a good achievement. Just the one added @syemo as I don't know whether to return to the Championship or not as we didn't techically win it. Our first season in the Premiership since 2008 is upon us and it's going to be one hell of a tough season as we're predicted to finish rock bottom of the Premiership but I feel we've got enough about us to survive. The first thing I done was to get our quality players onto proper contracts so now no other club can poach them thankfully although I did lose Sean Douglas to Crusaders due to my incompetence. Seven players ended up joining the club this transfer window as I wanted to replace the ones who had poor star ratings so Mark Cooling was released from the club but I don't have the heart to release club captain Andy Long although he will become a scout in the summer. All the players joined from Championship and Premier Intermediate League clubs - Aaron Jarvis and Noel Healy both joined from Distillery, Liam McKenna and Tiarnan Rushe arrived from Queens, Robbie Norton from Limavady United, Conor Mullen joined from Loughgall and youngster Chris Magee came from Newry. Brett Widdowson departed to join Dollingstown while youngster Jim Flynn went to Kilmore. If you ignore the disappointing loss away to Rosario then preseason was quite successful as we had six of our seven games and kept five clean sheets but we didn't play any "massive" sides and all games were away from home before the league opener against Crusaders. Our preparations began with a 3-0 win against Portavogie Rangers before that shock Rosario loss but then the side bounced back with a 2-0 win against Holywood and then edged a seven goal thriller against Loughgall in which we won 4-3 at Lakeview Park. We then concluded preseason with three clean sheets in the space of six days as Albert Foundry were beaten 4-0, Rathcoole were also beaten 4-0 and then Premier Intermediate League side Harland & Wolff Welders were beaten 2-0 at Tillysburn Park. 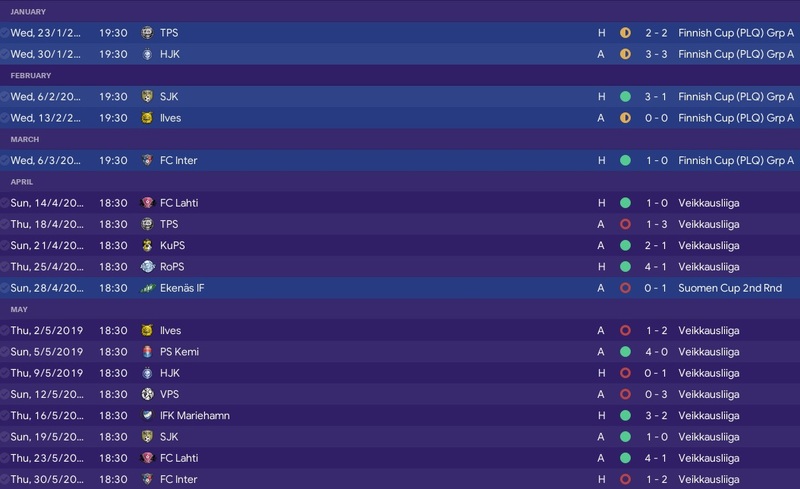 The last piece of this preseason update is that I've been allowed to go onto another coaching course which will see me secure my Continental B Licence should I be successful and then I'd only need to go onto two more coaching courses before I've got the full set. This is a longer course as it'll take approx. 6 months worth of study to potentially get the licence and the football club is covering the course which is going to cost them one thousand two hundred pound so I better pass. Welcome to the Championship/Premier Intermediate League in Northern Irish football and the curse of non-contracts. Yep it's a tough final month @KEZ_7 especially with three of the last four games being on the road. It's completely tough final month of the season @bigmattb28. The final month of the season began with a tough trip to Newry City and a single goal gave us a 1-0 win and then four days later we travelled to Ballyskeagh and recorded an excellent 3-1 victory on the road but those back to back victories haven't secured a playoff spot yet. In the Intermediate Cup semi final we beat Premier Intermediate League side Harland & Wolff Welders 4-2 after extra time to advance to the final in which we'll face fellow playoff contenders Distillery in the final. Back to league action and our only home game this month saw our playoff hopes suffer a massive blow as Knockbreda won 2-0 at Bangor Fuels Arena but on the final day of the season we made the playoffs against all the odds after a sensational 4-0 away win at the league champions Ballinamallard United and it was a fantastic end to a tremendous season. The final game of the month was the playoff first leg away to Knockbreda and the game remained in place after a 1-1 draw. 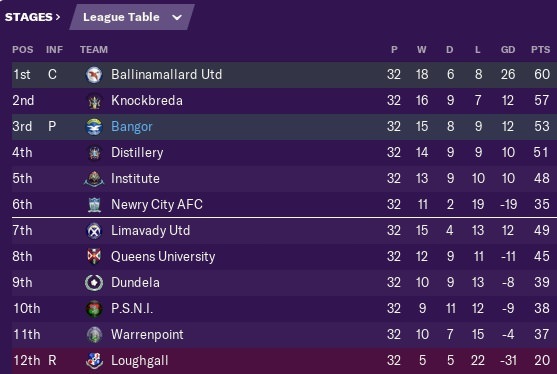 Our first game in May saw us play the playoff second leg at home to Knockbreda and a 4-2 victory saw us progress to the relegation/promotion playoff which happens to be against our fierce rivals Ards and the first leg Bangor Fuels Arena saw us secure an excellent 3-1 victory which has put us in control. We won the Intermediate Cup after beating Distillery 3-0 and then beat Ards 1-0 in the second leg to secure an unlikely promotion to the Premiership and our first time in the top flight since 2008. It'll be interesting to see were you head to next. Good work with East Bengal. Oh indeed it's a big month ahead @Dan. Cheers @Rocco17, it's been a fantastic season regardless of what happens. Still in the hunt for the playoffs, last month was quite a positive month but it was also important that the form maintained as we have reached the business end of the campaign and the first game in February was one to forget as we suffered an unacceptable 4-0 home defeat to Newry City and we deserved nothing from that game, eleven days later and the side progressed to the quarter finals of the Intermediate Cup but needed penalties to defeat the reserve team of Portadown - back to league action and a trip to Breda Park saw us beat Knockbreda 3-0. Four days after that win at Knockbreda we then welcomed the league leaders Ballinamallard to Bangor Fuels Arena and a superb performance saw us record a 3-1 success but the final game of February saw us draw 3-3 at home to fellow playoff contenders Distillery. Speaking of fellow playoff contenders, our only league game in March saw us beat Institute 2-1 at home and then we beat the same team 4-0 in the quarter final of the Intermediate Cup again at home. 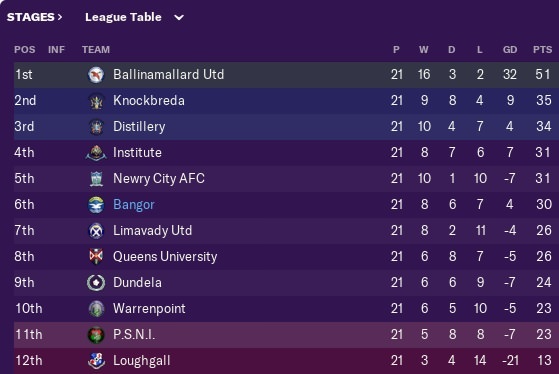 Heading into the final month of the league season and we still remain in the haunt for the playoffs and it's incredibly tight as there's only seven points between Institute in fifth and Knockbreda in second. We're currently fourth. 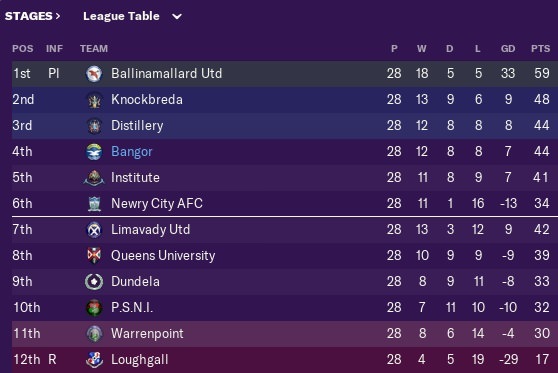 Ballinamallard United have secured a bare minimum of a playoff spot but they'll win the league barring a complete collapse and to the surprise of no one, Loughgall have been relegated to the Premier Intermediate League while Warrenpoint Town, PSNI and Dundela will fight it out to avoid the relegation/promotion playoff spot. So there's just the four league games remaining with three of them being away from home against Newry City, Distillery and Ballinamallard while we also host Knockbreda. The semi final of the Intermediate Cup is also scheduled to be played throughout April - should we make the playoffs, I will add the playoffs to the next month so potentially expect both April and May to be added as one. Always remember @bigmattb28 that we were predicted to struggle in the Championship so the fact we are currently sixth, well, I can't complain too much. Oh indeed I was @Dan and I'm glad it wasn't when it perhaps could've been disastrous. On the back of what turned out to be a poor December it was important we bounced back as the new year came around and the first game of twenty twenty one saw us exit the Irish Cup at the fifth round stage as Premiership side Larne beat us 2-1 at Bangor Fuels Arena before we then defeated leaders Ballinamallard United 1-0 at home just the three days later. We then had an eleven day rest to get the squad refreshed before the third round of the Intermediate Cup as we squeezed past Amateur league side Crewe United, recording a 2-1 success and I thought it might've been a lot more comfortable than it turned out to be - the final game of January saw us make the journey to Derry's Brandywell Stadium to face Institute, the game finished 1-1. 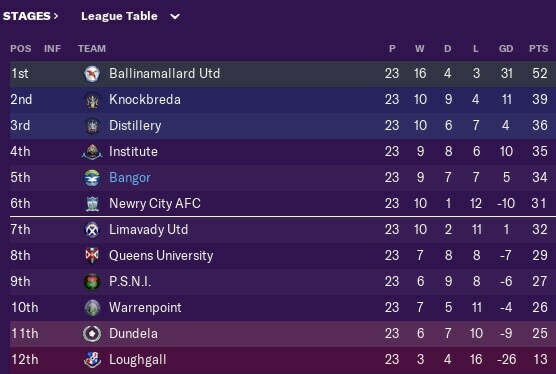 A decent enough month has seen us rise up a position to fifth but we're still well adrift of the Championship leaders Ballinamallard who look like they're going to guarantee the title sooner rather than later while at the basement Loughgall still prop up the table and look a little doomed so far as they're thirteen points from safety but I'm delighted we've secured a top half finish on Bangor's return to the Championship - we can still secure a bare minimum of a playoff spot as it's incredibly tight. With only one game currently being scheduled for March I have decided to throw the two months together although should we progress in the Intermediate Cup against Portadown Reserves then I believe the next round will be played in March. Apart from the Intermediate Cup game there's four Championship games in February with three of them being at home against Newry City, Ballinamallard United and Distillery while we travel to Knockbreda three days after the Intermediate Cup tie. Our one league fixture in March sees us host Institute. The final piece of news this January is that the (new?) board are allowing me to go on my latest coaching course which will see us get my Continental C Licence should I be successful in doing so. Just like the other updates, it's going to take approx. four months worth of study to complete the the football club are covering the nine hundred and sixty pound fee for the course. The file is working absolutely fine. When is the next one released? There's new challenges at the beginning of each month. Same @bigmattb28 , I'm sure Ballinamallard will drop points eventually. December was a month to forget as we didn't win a single league fixture throughout the month which I'm hoping turns out to only be a blip. The month did begin however with progression in the Irish Cup after defeating Mossley 3-1 at Mossley Recreation Ground but then three days later Distillery beat us 3-1 in our first league game of the month and then Dundela easily won 3-0 at Bangor Fuels Arena. We then had a twelve day break before our next Championship game which was a home game against Institute and that finished 1-1 before the month concluded with a six goal thriller against Queens University Belfast as the points were shared in a 3-3 draw, a game we probably should've won. 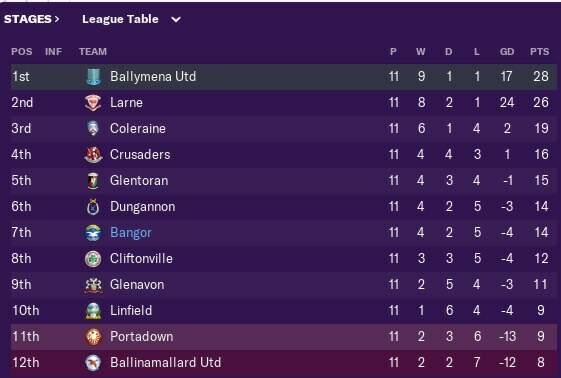 A poor month has seen us slip from third to sixth and now we're a staggering twenty one points behind the leaders Ballinamallard who don't seemingly want to slip up but somehow our goal difference is still positive. Loughgall remain bottom and ten points adrift of both PSNI and Warrenpoint and the latter has had a terrible campaign. Just three games are currently schudeled for January but I believe the first game in the split could be played so it may be four. They're all home games in three different competitions - in the Irish Cup we face Premiership side Larne, Ballinamallard in the Championship and then Amateur side Crewe in the third round of the Intermediate Cup. 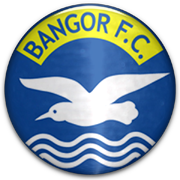 Due to the good work that I've been doing at Bangor Football Club, I have received and turned down two job interviews from clubs in England. Sutton United were first to offer me an interview before Hartlepool United soon followed suit. Both rejected though as I've been enjoying managing Bangor and would love to complete Northern Ireland before moving onto a different country.